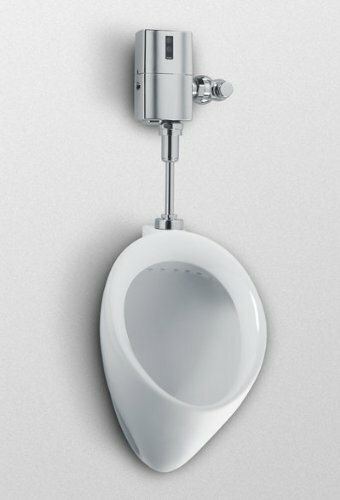 This item is a combination of the TOTO UT104E#01 compact commercial urinal and the TEU1LN12#CP EcoPower flush valve. The UT104E#01 features powerful washdown flushing action, an integral trap, 3/4" top spud inlet and 2" I.P.S. outlet. The TEU1N12#CP features a revolutionary EcoPower hydropower self-generating system. This unit features a superior piston valve that resists warping; a neutral rough-in; and an automatic flushing system that provides a "courtesy flush" every 24 hours. In addition, the 1.28 GPF EcoPower HET valves are also available for use with both standard vacuum breakers and 24" vacuum breakers and feature a manual flushing button.